What better way to kick off the summer season then with a picnic on Memorial Day!Â We can pack a wonderful picnic lunch with all your favorites â€“ corn on the cob, hot dogs, fried chicken, potato salad, plus of course watermelon (whatâ€™s a Memorial Day picnic without watermelon? 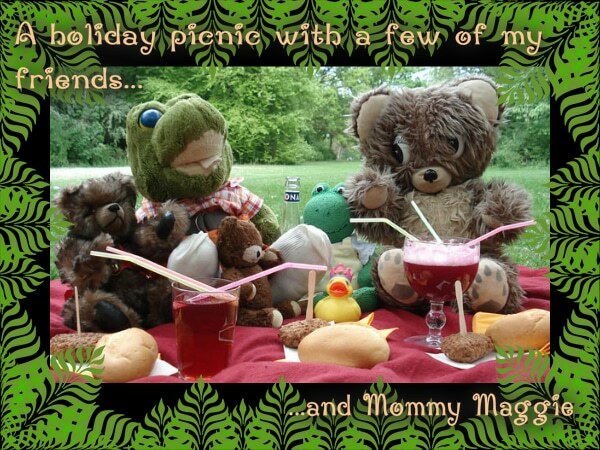 ).Â But I always say the more the merrier, so letâ€™s bring all your stuffed little furries and plushies too!Â We can have a regular outdoor picnic with all your soft little friends to share in the fun! And after you have tuckered yourself out form all the play, and after I have laid you down for a diaper change, it will be time to lay your head down for a well deserved nap in the afternoon â€“ wonâ€™t it be comforting to have all your friends to cuddle up with and guide you off to dream land (that way you will be well rested for the fireworks at night! )?Â And yes, we can light sparklers and run around at night and catch fireflies as well, making out picnic complete! So what do you say? Shall we have an Adult Baby picnic with all your plushies?